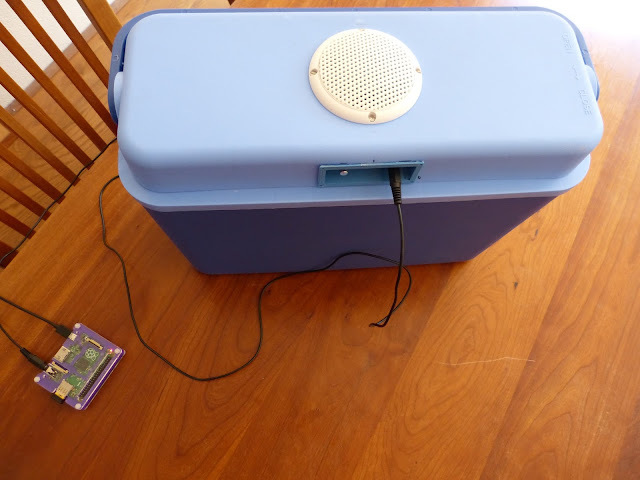 In my previous blog post I finished my audio cooler. It's a small cooler with a tiny audio system that nevertheless sounds good. The only way to control the audio is through a wired connection. It would be a nice addition to have some kind of remote control either by WiFi or Bluetooth. 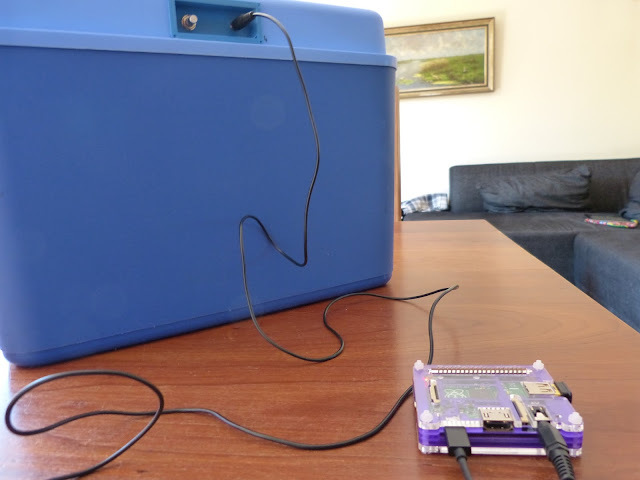 While testing the cooler I've got the idea to connect a Raspberry Pi A+, that was still unused, to the cooler and stream audio over WiFi to the Pi,with the Pi wired with the cooler. This could be useful for a garden party or BBQ where WiFi is available and I don't want to attach the smartphone to the cooler. In this blog post I'll share my experience with installation and operating the software needed for this project on the Pi. Raspberry Pi A+ (in it's Pimoroni Pibow case) connected with the headphone jack to the cooler. The Pi has a small Edimax Wifi adapter. Since I run the Raspberry Pi headless I use SSH login to the Pi. SSH is available for most operating systems with the notable exception of Windows. I already had Raspbian installed on the Pi so first I updated the OS and rebooted. Next I created a .conf file for the Edimax WiFi USB adapter. I learned from a previous project that, for a good remote connection, the sleep mode of the Edimax needs to be disabled. In the /etc/modprobe.d folder on the Raspberry Pi a file needs to be created with the name 8192cu.conf (8192cu is the name of the Realtek WiFi chip where the Edimax is based on). According to some sources on the internet a sound driver (sudo modprobe snd-bcm2835) should be installed on the Pi however I found it was already installed, probably with Raspbian. This can be checked with the lsmod command. With MPD and MPC installed I'm finally able to stream a radio station from my Pi to the cooler but I needed to add stream urls of my favorite stations. In the example below I add the stream of a Dutch radio station to the current playlist. The file with the name aplaylist.m3u file is created in the folder /var/lib/mpd/playlists with the above url of a stream in it. Of course other urls can be added to the playlist. I've found this list very helpful if you're looking for (Western) European streams. To create a playlist of music that is stored somewhere as mp3's just add these files to the folder /var/lib/mpd/music on the Pi. Before the files are copied however the permission of this folder has to be changed. That is done by adding write permission to the group and by changing the group to audio (which is currently root). Now the mp3's can be copied. To create a playlist of these mp3's first clear the current playlist, create a new one by adding mp3 files and save the playlist. The last command updates the database of MPD. By adding more files the playlist increases in length. To play the playlist use the same command as above (mpc play). A music or internet stream over WiFi to the cooler is a nice addition. MPD is a very stable music player with lots of different clients, perfect for these kind of projects. With MPC I can easily add streams, create playlists, play music or even store mp3's on the Pi. Unfortunately WiFi with a Pi has some downsides too. The Raspberry Pi takes up space in the cooler and it will drain the small battery fast. Therefore as a next step I'll try bluetooth because it probably adds less weight to the cooler and has less power consumption. Yes, the Raspberry Pi with MPD is a nice addition to the cooler but it has it's drawbacks such as power consumption and added occupied space.